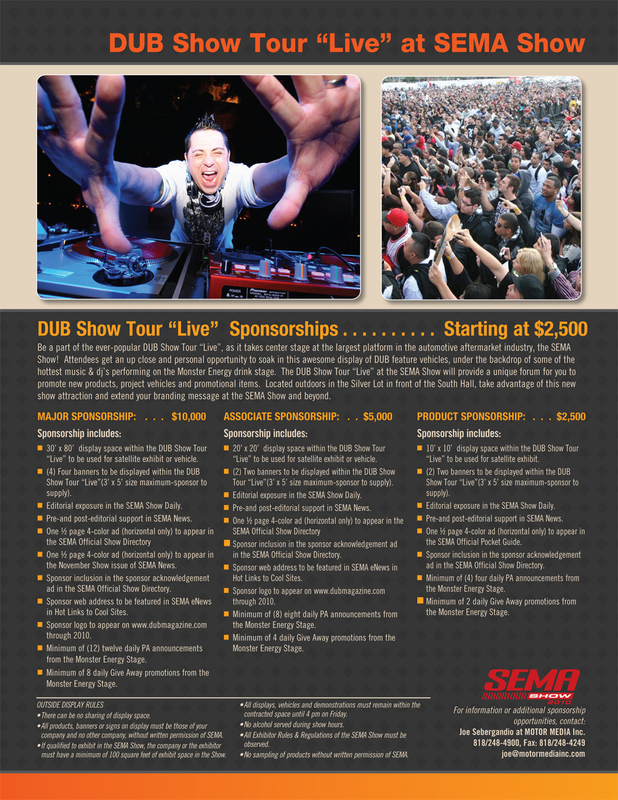 A longtime SEMA Show partner, DUB will make the final stop of its 2010 DUB Show Tour Live at the SEMA Show. The DUB Show Tour Live, a traveling automotive and lifestyle event produced by the popular namesake magazine, will make its final stop of this year's schedule at the 2010 SEMA Show. Located in the outdoor Silver Lot in front of the South Hall, the Tour will offer exhibitors an opportunity to promote new products, feature vehicles and marketing campaigns within the backdrop of today's hottest music and live DJs. "I remember walking into the SEMA Show more than 18 years ago and being overwhelmed by how powerful SEMA is for the marketing of all the great products and member companies,” says DUB President Myles Kovacs. "I'm still amazed every year at how much the SEMA Show has grown, and SEMA allowing us the opportunity to have the DUB Show Tour Live stop at the 2010 SEMA Show is a huge honor for DUB." Sponsor programs, open exclusively to 2010 SEMA Show exhibitors, start from $2,500 and include satellite display, signage and more. Take advantage of this new Show attraction and extend your branding message at the SEMA Show and beyond. Space is limited, and companies must be exhibiting at the SEMA Show to participate. Click here to learn more, or contact Joe Sebergandio at Motor Media: 818/248-4900 or sales@motormediainc.com.